The Middle School Counselor Has Joined Teachers Pay Teachers! It's official. 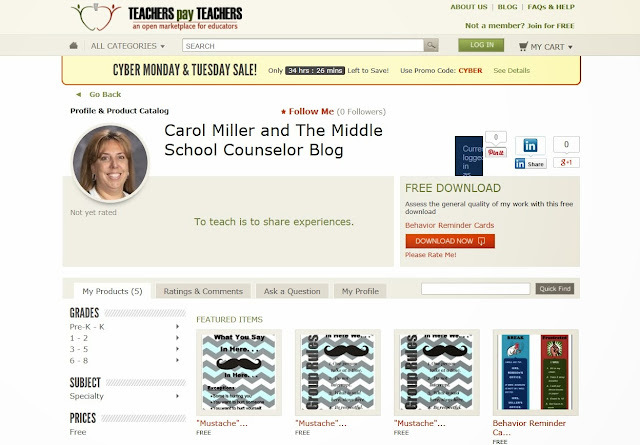 I have joined Teachers Pay Teachers as a seller. I will be (although it may be slowly) adding all the downloads I have posted on my blog. It will just be one more way for me to share with you the resources I use in my own office. TPT has some great resources. If you haven't used it yet, you really should take a look at it. There are a lot of great free resources on there that you can download. All you need to do is sign up for an account. I'm so glad you are making your great creations available. I think a great item for you to sell would be your feelings Bingo game. I know I'd buy the set! Nice game bingo game i like it, we are also provide online education and Buy College Degree online with a reputable university.